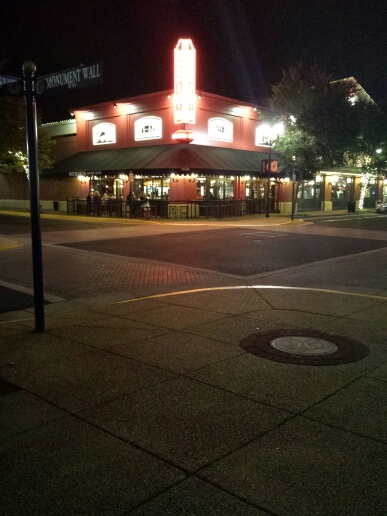 Ozzie’s is one of the restaurants owned by the Great American Restaurants chain which includes Coastal Flats, Silverado, Jackson’s, Sweetwater Tavern, among many others. 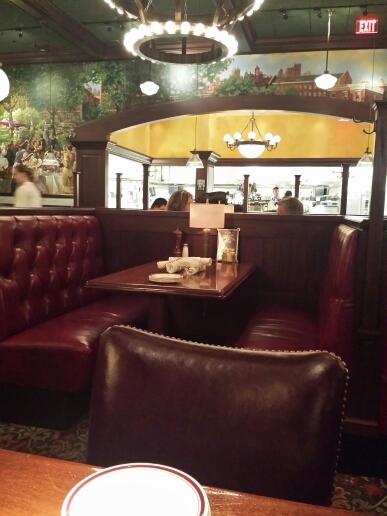 It offers comfortable setting, casual ambiance, open space, outdoor tables, all American foods and red-leather booths around the central dining area. The wait staff is courteous and warm. 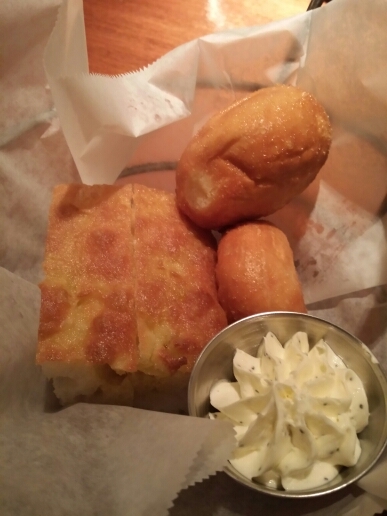 The service is quick and the bread and butter make you feel welcome. Two receptionists are great too. 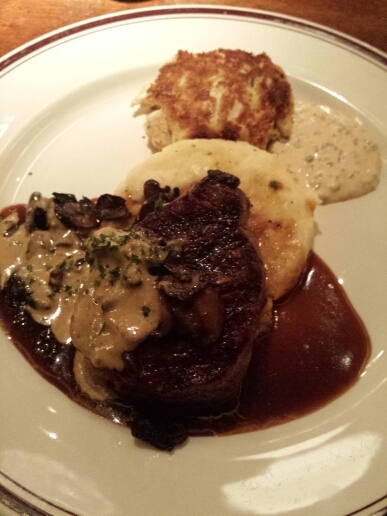 We had calamari and shared its Monday night special: filet mignon and crabcake combo. 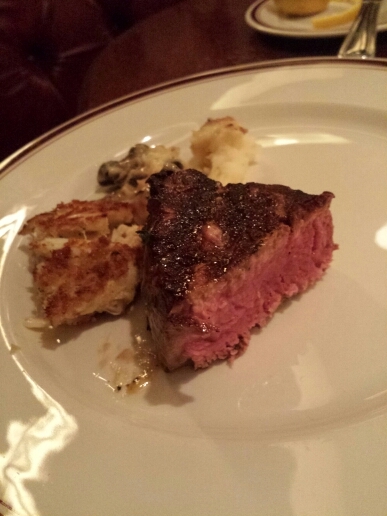 Both were great and the filet was wonderfully done: tender and juicy, warm pink center, slightly charred on the outside with good amount of seasoning. The size was just right for the two of us. Every bite was as good as the other one. Excellent job. 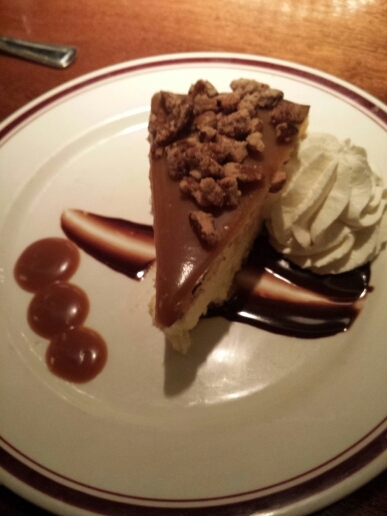 The turtle chocolate cream cheese cake; super rich and creamy, along with a cup of coffee added a nice, satisfying finish to our excellent meal. A good way to start a week on a rather chilly Monday night in Northern Virginia. Posted by hslu in Global Affair, Islam, Middle East, Obama, Politics. 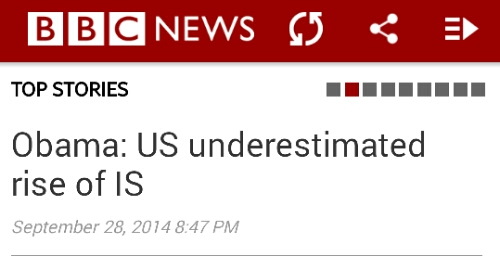 Obama: I underestimated rise of IS. He prefers to play golf instead of listening to the boring national security briefings every day. To Obama, who has absolutely no foreign policy experience except making a few speeches here and there in foreign countries, chasing a 1.680″ OD white ball with dimples weighing no more than 1.620 oz is much more interesting. He Obama dropped the ball so to speak. Not U.S. agencies. Posted by hslu in China, Cold War, Economics, Global Affair, Middle East, Military. It’s happening now. The pace will pick up. It’s a matter of when, not if. When it’s finally here, Americans will find them poorer and the U.S. federal government will run out of place to borrow. Have you heard of ‘NCO1: as in New Currency Order #1. I bet you haven’t. It is okay. About 99.9999% of Americans do not know what it is. So, don’t get too antsy about it. Nothing is imminent just yet. So, if you want to skip the rest of what I have to say, be my guest. Go play with your video games or update your Facebook pages on your iPhone and waste your life away. But, if you are curious, you might want to stay around, check it out and see for yourself. Of course, I am talking about U.S. dollar losing its reserve currency status of the world. As of now, about 61% of the foreign currency reserves on the balance sheets of central banks in the world are in U.S. dollar; mostly in the forms of US Treasury notes and bonds. Since US economy used to account for 25% of the world economy, 61% says a lot about the importance of the greenbacks. Well, that ratio was about 71% at the turn of the century; about 14 years ago and the pace of decline is accelerating. 1. Foreign countries are sick of listening to U.S. government and Wall Street bankers telling them what to do. 2. Diminishing purchasing power of the U.S. dollar because U.S. Federal Reserve has cranked up the printing press and significantly increased the supply of the U.S. dollar in the world. 3. The Fed has no plausible exit strategy to deal with this unprecedent monetary experiment. When economy starts to pick up in America, the excessive liquidity in the financial system will push the economy into overdrive. Inflation will come. Interest rate will rise and the potential damage to the world will be unmeasurable. According to the latest data, as many as twenty three countries have started accumulating Chinese renminbi in their central banks. There are probably seventeen more countries which have some renminbi on their books but decide to keep the matter to themselves for various reasons that I don’t know of. Maybe they are afraid of America. Maybe they want to wait and make sure China won’t implode from within. They may think that America will wise up and reverse course of being the jerk around the world in many aspects of people’s life. Well, the U.S. dollar is still the reserve currency in the world and many countries, including China, still depend on U.S. dollars for international trades; particularly when it comes to oil because America told Saudi Arabia and other Arabic countries many decades ago that U.S. government will keep the royal families in power, silence on their human rights recordsand supply them with the most advanced weaponsin the world in exchange for settling crude oil trades in the U.S. dollars. Some economists believe that the Chinese yuan or Renminbi is destined to take over U.S. dollar as the reserve currency of the world particularly after the executive order NCO1 was announced by China. But, I don’t think China wants that headache and all China wants is to weaken the U.S. dollar and provide an alternative reserve currency to minimize the danger of currency hegemony. Well, bilateral trades of many countries with China has been settled in Renminbi without having to resort to U.S. dollars. One thing I don’t expect to happen is for certain countries to abandon the U.S. dollar any time soon. This will for sure keep the U.S. dollar in high demand. When Saudi is tired of the U.S. or Saudi’s royal family is chased away from power, then the demise of the U.S. dollar will be near and the day of the redbacks will be upon us. Time will tell if the world abandons the U.S. dollar. But things seem to be heading that way. 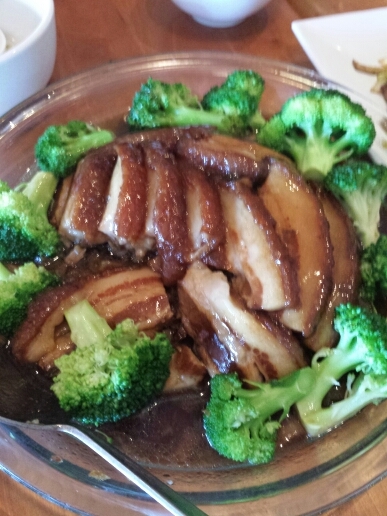 Posted by hslu in Chinese Food, Restaurants. 南北和 is its Chinese name. This Shady Grove branch is in a more affluent shopping center west of I-270 in Rockville, MD. It looks much better than the other places with the same name in Rockville on east of I-270. This restaurant has a busy lunch crowd and most of them ordered off the special lunch menu such as bento box lunch or combo Chinese plates. Our young Korean waiter has only been here for two weeks and every dish we have ordered off the Chinese menu was a first for him. He did A good job: courteous, patient, personal and didn’t make any mistake. Reasonablly good. Beef tendor was better. Eggplant was great. 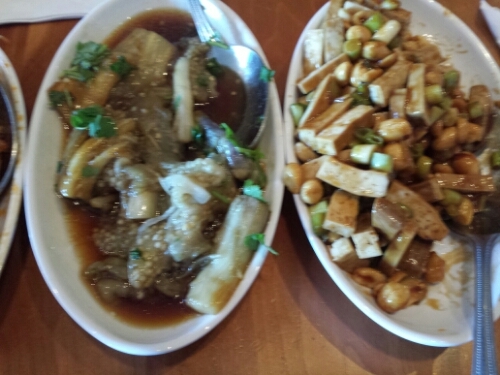 Peanuts and bean curd was ordinary. Too much filler. Needs more dried bean curd. 上海小餛飩 except the small wonton was still too large. 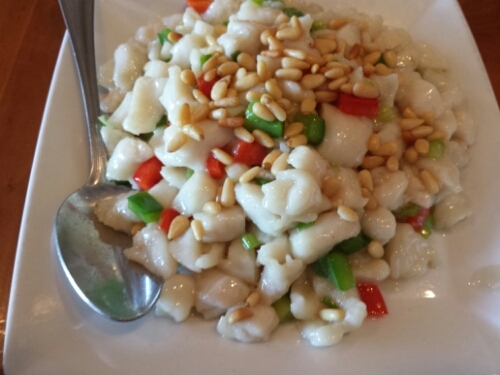 It is no where close to the 西塘陸氏小餛飩 we had in 西塘老街. Another wonderful dish: very tender fish filets in savory sauce. 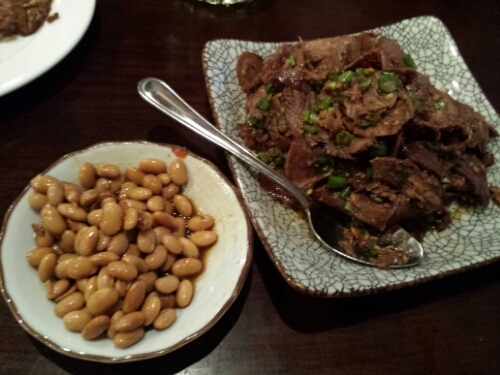 An authentic 梅菜扣肉: both 梅菜 and 扣肉 were professionally done. One of the best we have had in the east coast. Well worth the money. 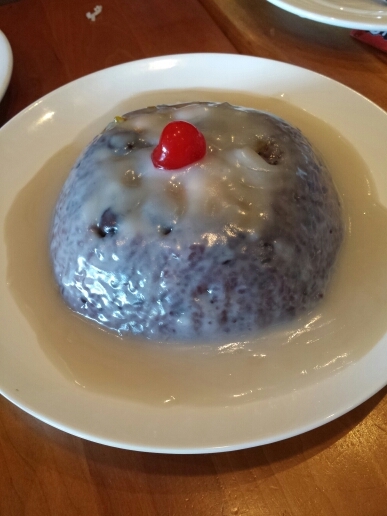 Black sticky rice with red bean paste. This was beautifully done. My only complain is: I will keep the sauce clear to highlight the purple rice. 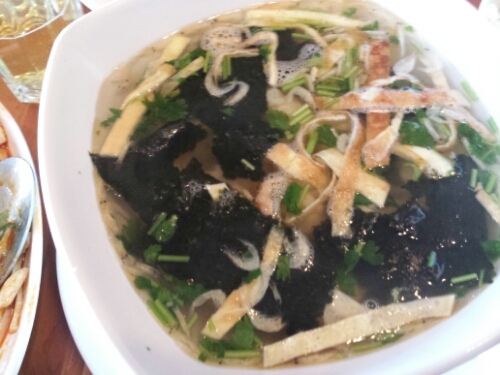 Bottomline: worth going back to try more dishes. Posted by hslu in Debt and deficit, Economics, stocks, Taiwan. Governments in Japan and Taiwan like to play fire with the stock markets. BOJ is following an unwritten rule, called “the 1% rule” by traders, where it buys ETFs after the Topix index falls around 1% in the morning session. It artificially props up the Nikkei because it is still 58.34% from its all time high of 38,957.44 on December 29, 1989. Taiwanese government likes to do that too and it has done it quite successfully. In fact, The Taiwanese government even uses the capital gains it made from the stock market to pay for federal deficits. In 2014, the capital gains will be NTD $50,000,000,000. The government does have a term for this money it makes from investors: 釋股預算. The stocks involved are: 合庫金, 兆豐金, 第一金, 台積電, 中鋼, 漢翔 and a few more technology stocks. The reason for this unprecedented stock market maneuver is this: the Taiwanese government has to rely on debt financing to function. In fact, 馬英九’s government will be short of NTD $300,000,000,000 for its 2015 budget. What I don’t know is who the suckers were in these transactions in the past and who the suckers are in the future when Taiwanese stocks go down eventually in the future. You better be careful out there. Posted by hslu in Congress, Election, Obama, Politics. America’s federal government has three branches: legislative, executive and judicial. In reality, I think The modern day America has FIVE branches: legislative, executive, Judicial, liberal media and special interest lobbyists. The liberal media controls the mindsets of majority of American people. Their influences on American policy are in your face day in and day out. Their tactics are timely, focused and non-stopping. They are the front men of the Democrat party. The special interest lobbyists work behind closed doors. They play money games with Senate and Congress Committee chairmen in the back rooms of Georgetown’s restaurants. They do power lunches and happy hours with congressional staff near the Capitol Hill because they work closely together to draft every bills that go infront of The Congress. They are the real forces behind American politics. The conservative talk shows don’t count in my book because they have a rather narrow audience base. These people, myself included, switch from one talk show to the next on AM dial but have so far failed to influence national election outcomes in any meaningful way. The real tests are coming but the damage to the U.S. has already been done. It may have been beyond repair after 6 years of Obama. Saddly there are still 2 more years to go under Obama and these six branches of the United States of America are doing their best to make sure that the U.S. is digging a hole so deep that it will never be able to get out from. Posted by hslu in Economics, Taxes. PIMCO has argued that the ‘new normal’ fed funds rate in 2017 will be 2 to 2.5%. I don’t know what it will be but I instinctively believed that it will be a lower number because the U.S. government can’t let it go up too much. The reason is very simple: America is broke. Higher interest rate will increase America’s interest payment and the government can’t afford it. For every 1 percentage point increase in interest rate, Uncle Sam has to add $160 billion to federal government’s budget just to pay the interests on the loans. Let’s call they what they really are: IOUs. Don’t call it Treasury Bonds or Treasury Notes as if the government can keep issuing new ones to pay off the interests and the principles on the old Bonds. They are IOUs and they have to be paid off one day. Just look at Japan: interest rate has stayed at or near 0% for the past 25 years becsuse of Japan’s massive national debt; now at 250% of Japan’s GDP after recent BoJ QE program. Interest payments on Japanese national debt and redemptions of JGBs by Japanese seniors account for 40+% of annual government budget. 40%. Yet, BOJ is considering more money printing to jack up inflation which will ultimately push up interest rates and debt payments. America is heading to that direction now that the Fed has gone through four runs of massive money printing and 8 years of near 0% interest rate policy. We’ll have to wait and come back in 2 years to see where nrw interest rate is. What I really like to know in 2017 is what percentage of our taxes goes to pay for the interests on the IOUs. Posted by hslu in Economics, Global Affair, Obama. The ‘Great Takeover’ is happening right in front of our eyes. You know what I am talking about. 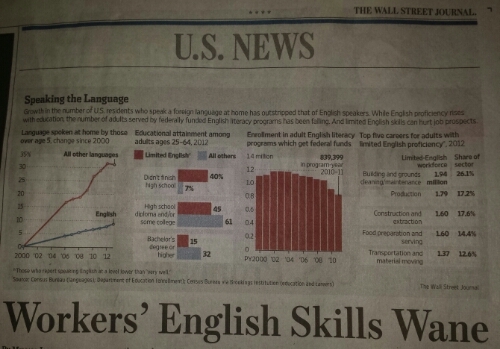 Thanks to Obama and his amnesty program, the pace has really picked up speed in recent years. The trend points to a downhill slippery slope and the point of no return has already passed. America is going down sooner rather than later. Someone has to pay for this terrible drag on American’s economy and the U.S. will lose the globalization war. Posted by hslu in Chinese Food. Been here once when it first opened about 9 months ago. This is our second time. Overall, it gets A passing grade but a few things could be better. 1. 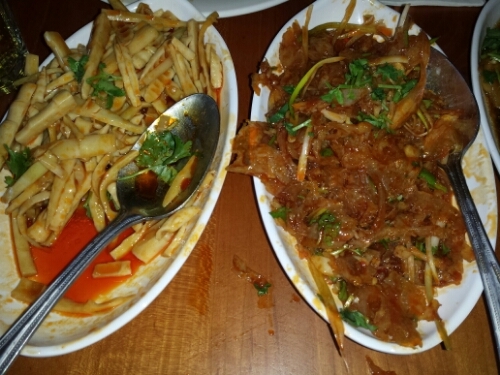 Two dishes we ordered weren’t available. That’s a no no. Dashifu shouldn’t let this happen. Crisp cucumber was out. Salty chicken was out. I could have ordered salty duck instead but my Dad won’t eat it. The selection on appetizers was limited because my Dad won’t eat them. 2. 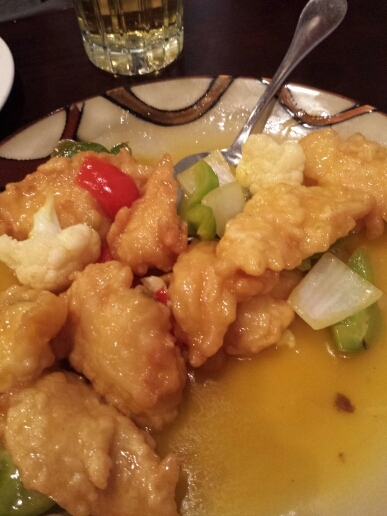 Sweet and sour fish filet was disappointing. The SS sauce needed more work. It was too watery and it wasn’t sweet enough. It also needed more lemon, orange and ginger too. I didn’t mind the deep-fried fish filet but the batter needed improvement. This dish got a F. Don’t order. I ordered it because my Dad might like it. 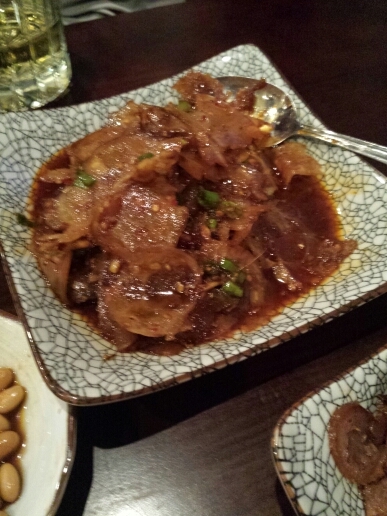 Marinated beef tenderloin and spicy beef tendon are both very good. 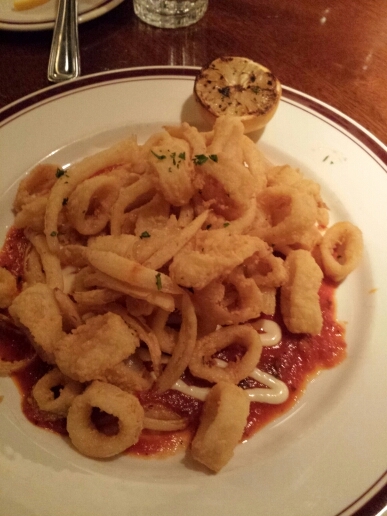 The portions were more than adequate too. We used to eat A lot of soybeans when we were in Taiwan many decades ago.People grew up in 眷村 knew what I talked about. 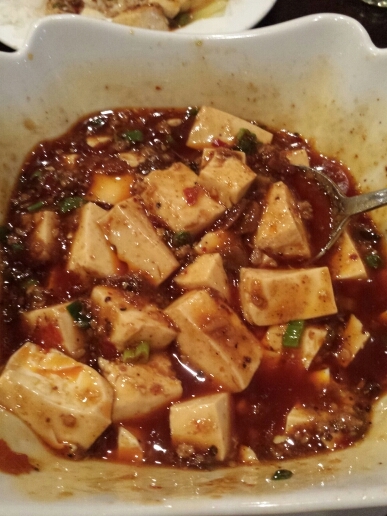 Ma po doufu 麻婆豆腐 was excellent: right amount of spiciness plus great flavor made it one of the best we have ever had in VA. 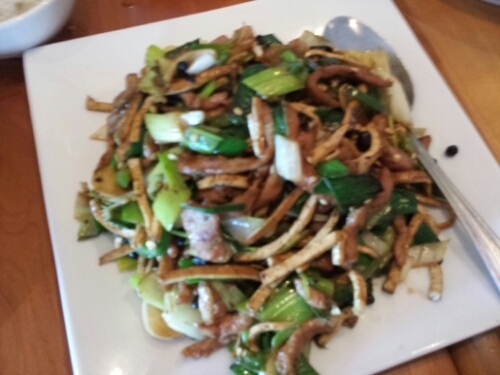 It looked like what 麻婆豆腐 was supposed to look like. You should try it. 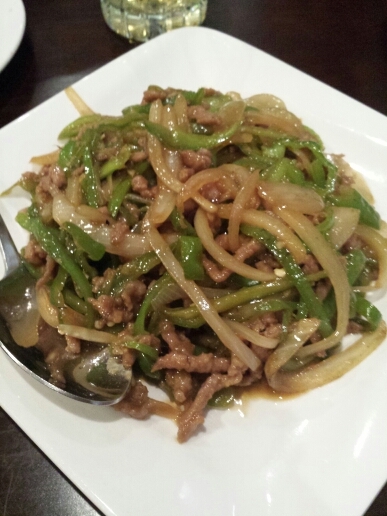 Pork with green chillis was okay but I can do it better. No kidding. 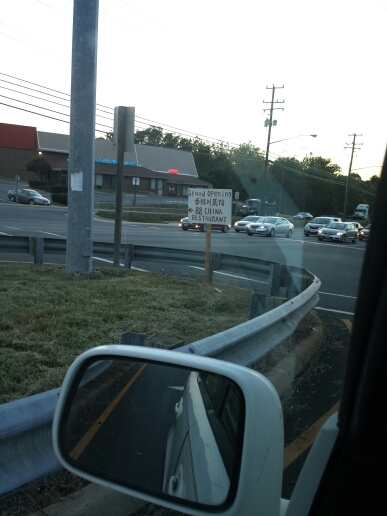 The sign was still here at the intersection even though it's been at least 9 months since its Grand Opening. By the way, 酒釀湯圓 could be sweeter and there wasn’t enough 酒釀 either. No picture on this dessert dish. Oh, the service was very personal and attentive. The pace of our meal was great. No waiting between dishes: one after another. Perfect timing just like the way my Mom treated my Dad’s friends many decades ago in Taiwan. If I could go back to the kitchen and give the chef a few tips when he worked on our dishes. Posted by hslu in Economics, iPhone. Watch Apple stocks. 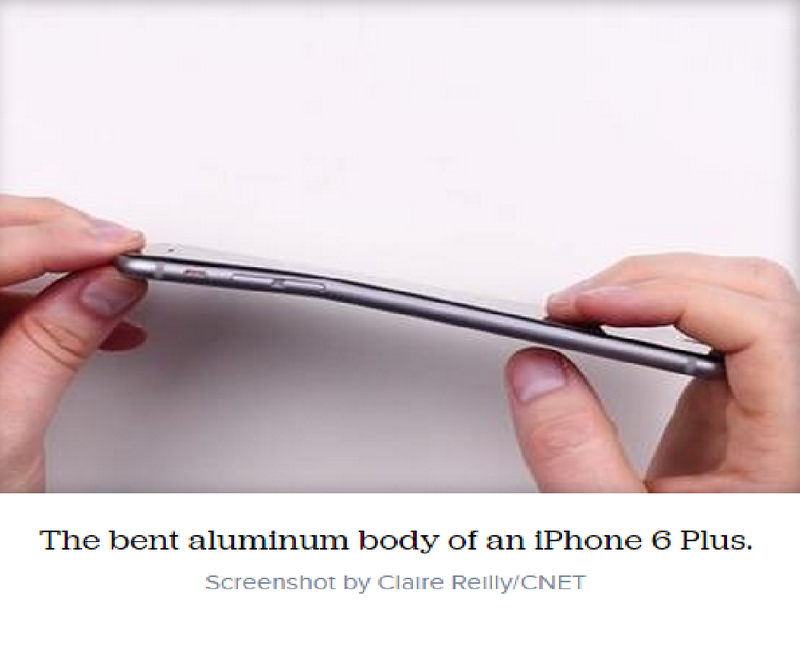 If more people complaining about bent phones, you want to get out before it is too late. When company breaks down, it starts with little things: Apple map, antenna, iCloud security breach, Apple OS mistake, bent iPhone6 Plus, etc. Little by little, people lose faith on the company and its products and the halo becomes tarnished and loses its shine over time. No matter how many times Apple claims to have test its iPhones, the fact of the matter is that Apple’s testing lab may be incompetent and its management may be too confident to see the obvious. What would Cook do? Issue a statement saying that he is sorry? May be he’ll bow like many Asian politicians and company executives do. Apple is behind in coming out new products. The company has been playing catch up for many quarters. Now Cook have a PR disaster on his hand. I doubt that many people will spend $345 for an iWatch.